Adelaide was Queen-consort of the United Kingdom (1830-1837) during the reign of King William IV. In an effort to show an economical side to the monarchy, Queen Adelaide’s jewelry consisted of her own personal collection and that inherited from her mother-in-law, Queen Charlotte. Probably the most distinguishable jewel in the Queen’s collection was actually made for a King. 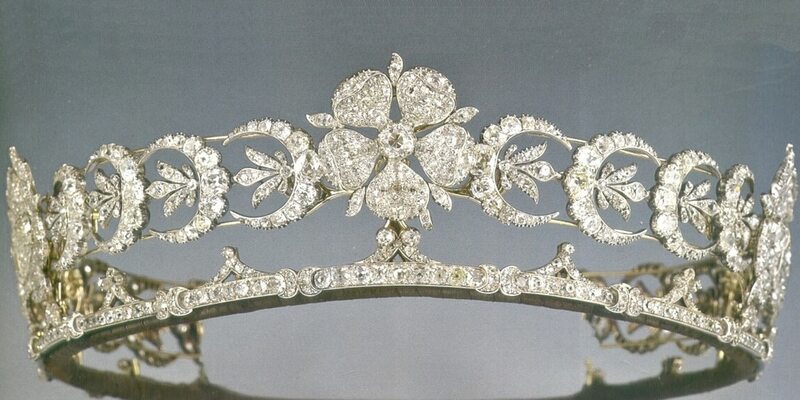 Diamond Diadem aka King George IV State Diadem. The repeated motifs so prominently displayed atop the diadem were each designed as a floral spray composed of the Rose of England, Thistle of Scotland and Shamrock of Ireland. It is interesting to note that these emblems are mounted in a manner that makes them removable. King George VI was passionate about the use of these representational emblems and this strong patriotic association is probably the reason that King George’s Circlet has survived for two centuries without a ruthless redesign. Passed from Queen Adelaide to Queen Victoria continuing through the generations to the current monarch, Elizabeth II, its popularity is undimmed. Paintings and photographs provide proof that the Diamond Diadem was proudly perched atop the heads of queens Regnant and Consort (never loaned to lesser luminaries). 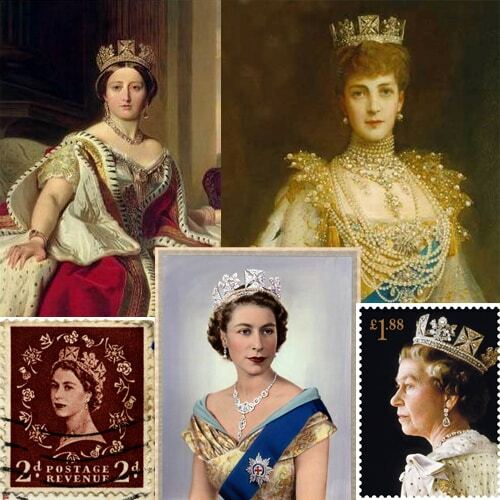 Queen Elizabeth II wears it to all State Openings and other historic occasions, and the Diamond Diadem is immortalized, along with her profile, on stamps, coins and folding money. 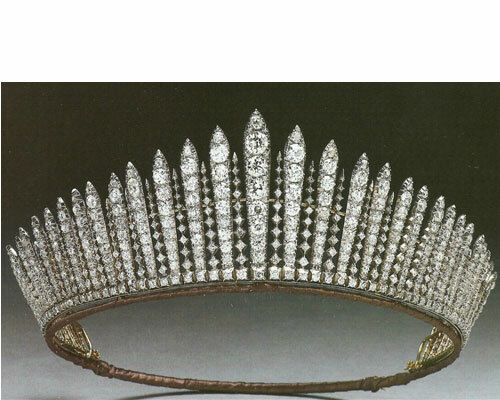 The Diamond Diadem a.k.a. King George IV’s Circlet has been Worn By Queens for Generations. Queen Victoria, Queen Alexandra, and Queen Elizabeth II. 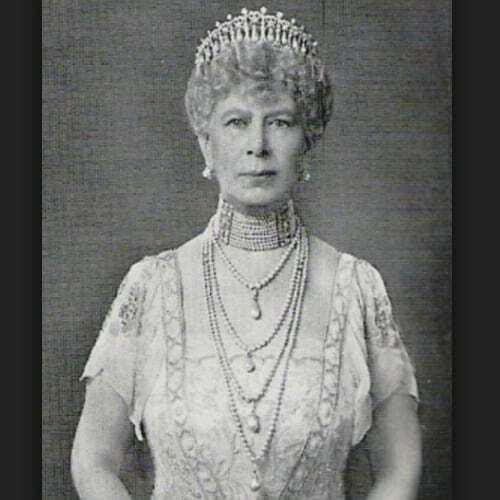 Queen Mary Wearing Queen Adelaide’s Fringe Necklace as a Tiara. Created from diamonds gleaned from King George III’s and Queen Charlotte’s jewels, Rundell assembled 133 diamond-set segments into a fringe tiara. Inherited from Queen Adelaide, the fringe tiara (sometimes referred to as the Hanover Tiara) was very popular with Queen Victoria. She is depicted wearing it in the popular 1851 Winterhalter painting “Queen Victoria and the Duke of Wellington” and is known to have worn it to the opening of the Great Exhibition and other events. Once widowed, she wore it as a necklace, preferring a smaller coronet as her symbolic headdress of state. 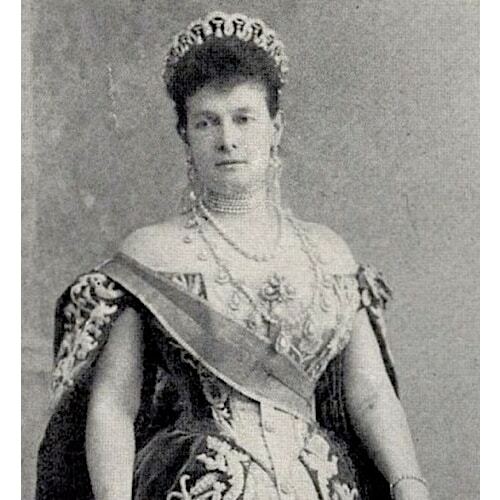 Queen Alexandra is depicted with the fringe suspended at her waist as a girdle, while Queen Mary turned it back into a tiara but she didn’t care much for it. 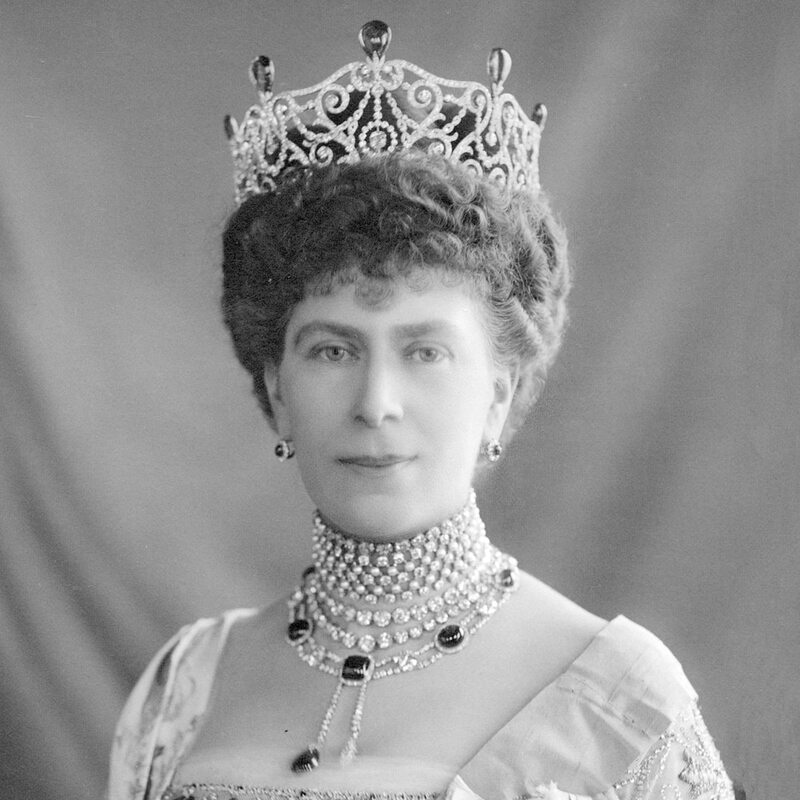 A new fringe tiara was created in 1919 to replace it and, when Queen Elizabeth (Queen Consort to King George VI) inherited Queen Adelaide’s Fringe Tiara in 1936, it was once again transformed into a necklace. It passed to Queen Elizabeth II in 2002. Queen Victoria was born Princess Alexandra Victoria of Kent, the daughter of the Duke of Kent (fourth son of King George III.) Upon ascending to the throne of Great Britain, Queen Victoria received the jewelry regarded as “heirlooms of the Crown.” Included in that illustrious inventory was what remained of Queen Charlotte’s unparalleled collection (unaltered) along with that which King William IV had re-set for Queen Adelaide. Queen Victoria’s jewelry collection benefited greatly by the many gifts of State and tributes of Empire. 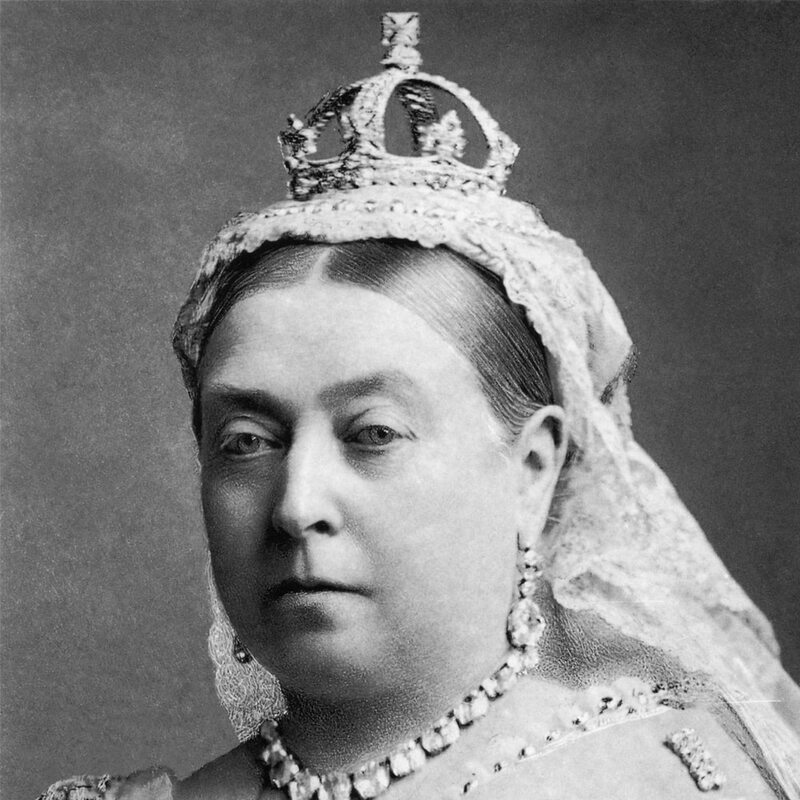 Considering that both India and South Africa were part of the British Empire, it’s no surprise that Queen Victoria could literally cover herself in diamonds. 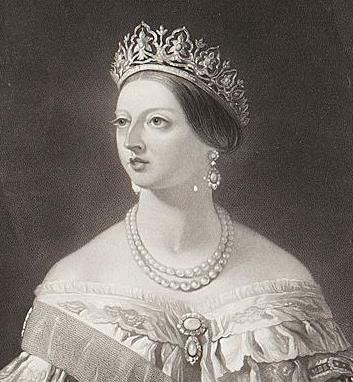 When the Hanoverian diamonds were surrendered by the English Crown to the King of Hanover, Queen Victoria’s reaction was to require an especially thorough inventory of the Crown jewels. Eventually, she delineated in great detail which jewels were heirlooms of the crown and which were personal property of the Queen. 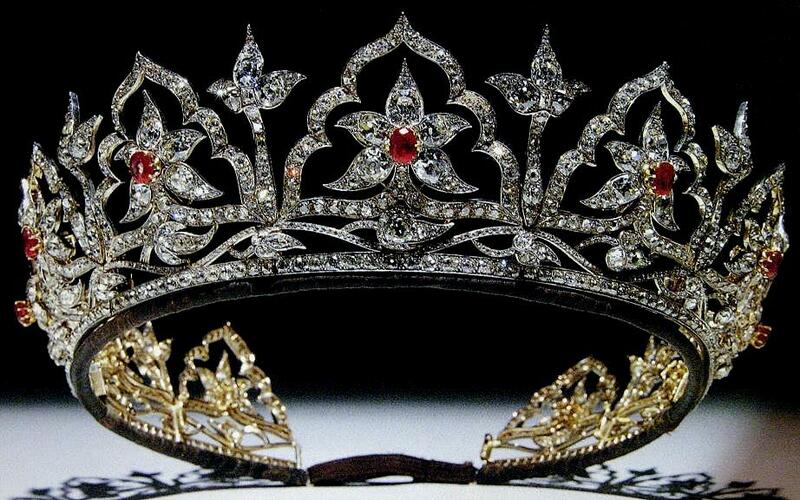 The Oriental Circlet Ruby and Diamond Tiara. Queen Victoria wearing The Oriental Circlet in its Original Configuration. 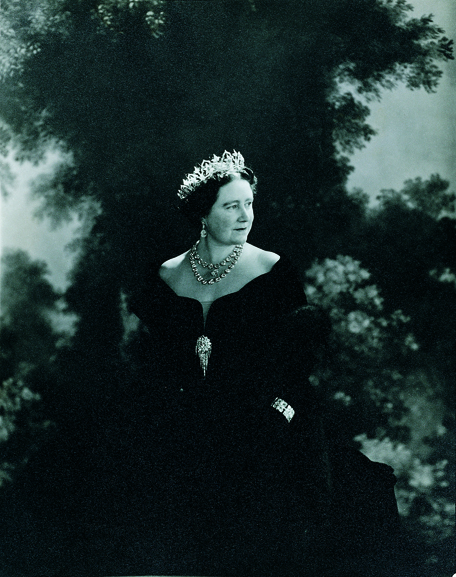 Cecil Beaton photo of Queen Elizabeth (Queen Mother) Wearing the Oriental Circlet. Photo Courtesy of the Victoria and Albert Museum Collection. Queen Victoria Wearing the Small Crown. After the death of the Queen’s beloved Prince Albert she wanted a more diminutive crown to wear atop her widow’s cap. in 1870 Garrard & Co. designed a band of brilliant, rose and mixed-cut diamonds crested by four each diamond-set crosses paty and fleurs-de-lis. Removable arches were surmounted by the monde pave-set with brilliant and rose cut diamonds and topped by a cross paty centering a larger brilliant.The diamonds likely came from a large fringe necklace and most probably a large chaine de corsage in the royal inventory. Queen Alexandra Wearing the Small Crown. This tiny crown so symbolized the reign of Queen Victoria that she bequeathed it to the Crown. It became a favorite of Queen Alexandra and, when Edward VII died, she had a hard time relinquishing it to Queen Mary. King George VI officially added it to the Regalia in the Tower regardless of the fact that it was never worn for a coronation ceremony. Created in 1919 by E. Wolff & Co. for Garrard & Co. from diamonds originally mounted in Queen Mary’s wedding tiara. 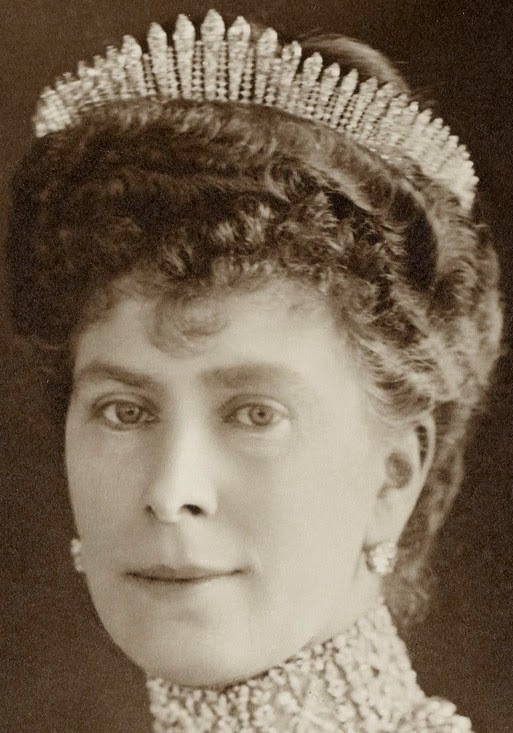 The fringe tiara style was very popular among the royals and the Queen Adelaide tiara, which Queen Mary already possessed, was not as precisely graduated as she would like additionally, it was somewhat large. Queen Mary wanted a more up-to-date version with a more even, sleek appearance, thus the order was given to create this “retooled” design. These two tiaras are often confused in portraits and photographs. 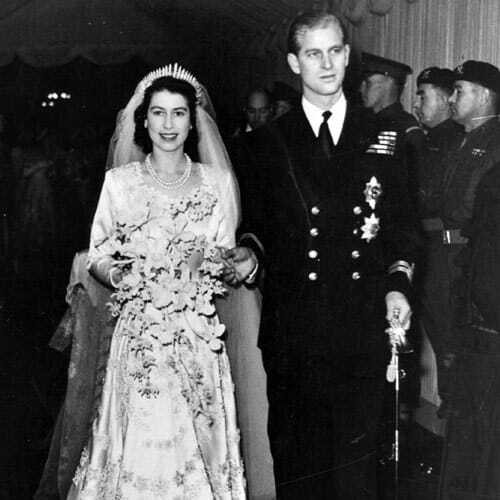 The Queen Mary Fringe Tiara was eventually given to Queen Elizabeth who loaned it to Princess Elizabeth in 1947 for use as her “something borrowed” wedding tiara (Princess Anne wore it for this purpose, too.) 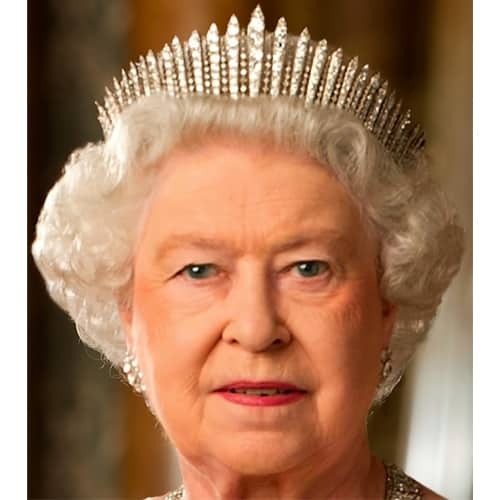 Queen Elizabeth II inherited it in 2002 and can be seen wearing it in recent photos. 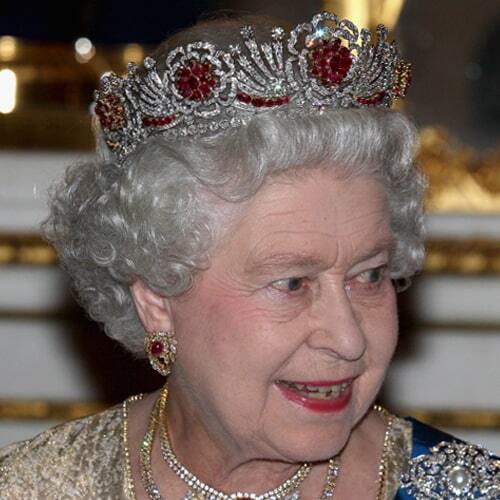 Queen Elizabeth (Queen Mum) Wearing the “New” Fringe Tiara. Princess Elizabeth Wearing “Something Borrowed” by way of Queen Mary’s Fringe Tiara, 1947. Queen Elizabeth II Wearing the 1919 Fringe Tiara. The Delhi Durbar Tiara as it Appears Today. The Delhi Durbar Tiara was designed by Garrard & Co. as part of a magnificent parure to be worn to the 1911 “Delhi Durbar.” King George V was the only Monarch ever to attend the festivities and the Queen Consort needed to look her regal best. 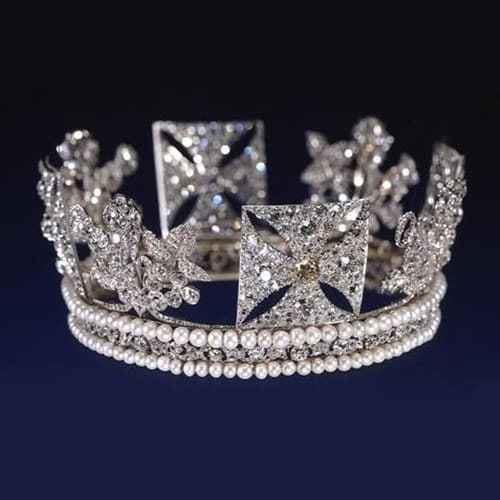 The tiara featured diamonds upcycled from a Boucheron Tiara and additional stones bestowed by De Beers while Mary was the Duchess of York.There were emeralds in the original design taken from a necklace previously property of the Duchess of Cambridge. During subsequent re-models, Garrard removed the emeralds and added (then later subtracted) the Cullinan III and IV diamonds. 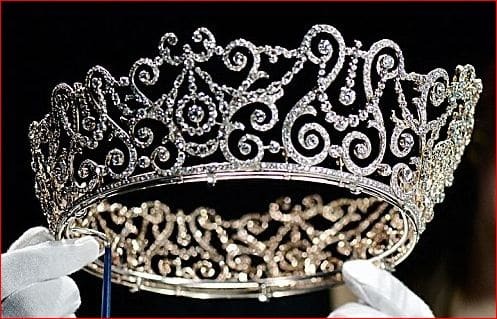 The tiara was on loan from Queen Mary to Queen Elizabeth (Queen Consort to King George VI) to be worn for the 1947 South African Tour. 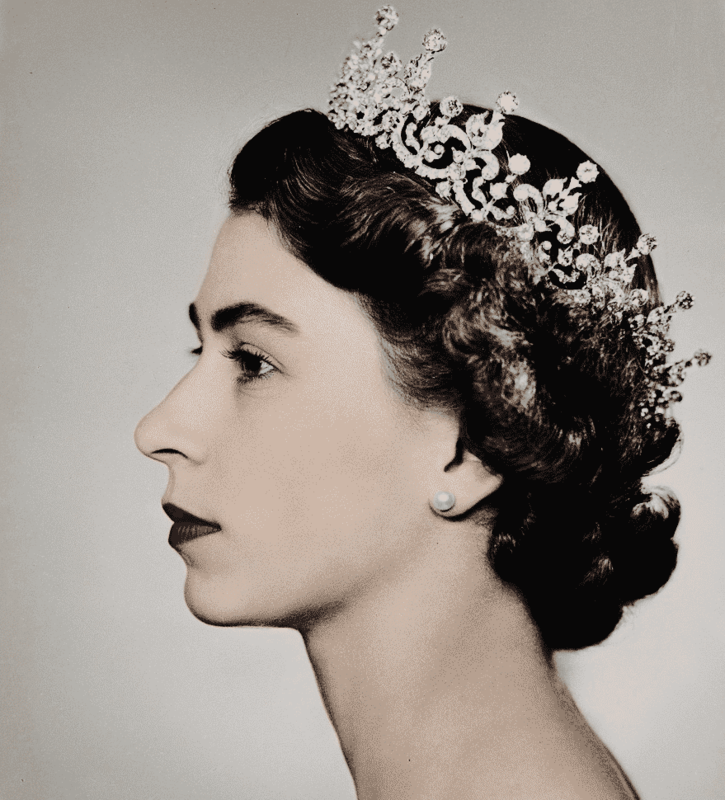 Queen Elizabeth kept the tiara until her death. Eventually inherited by Queen Elizabeth II, it is currently on loan to The Duchess of Cornwall. Queen Mary Wearing the Delhi Durbar Tiara with the Original Emeralds in Place, c.1911. 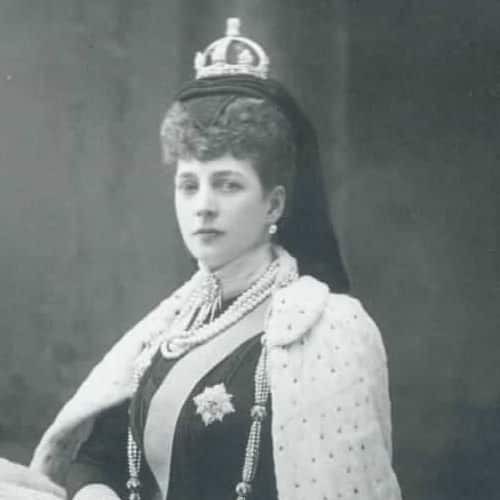 Queen Mary Wearing the Delhi Durbar Tiara with the Cullinan III and IV and the Emeralds Removed, c.1911. 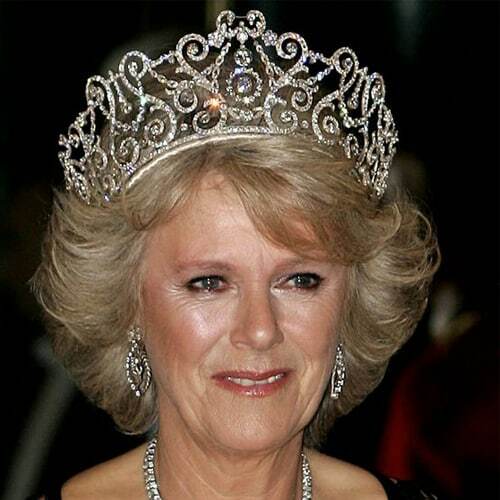 Camilla, Duchess of Cornwall, Wearing the Delhi Durbar Tiara. Created E. Wolff & Co. for Garrard & Co. in 1913, the design was adapted from a design favored by Queen Mary’s grandmother. The 1818 tiara had a very Gothic late Georgian design aesthetic and that influence is evident in the motifs and swags in the updated model. Originally the Lover’s Knot Tiara was decorated by numerous pearls repurposed from several historical sources. Many of those pearls were removed (during various remodelings) resulting in a more streamlined design than was originally intended. 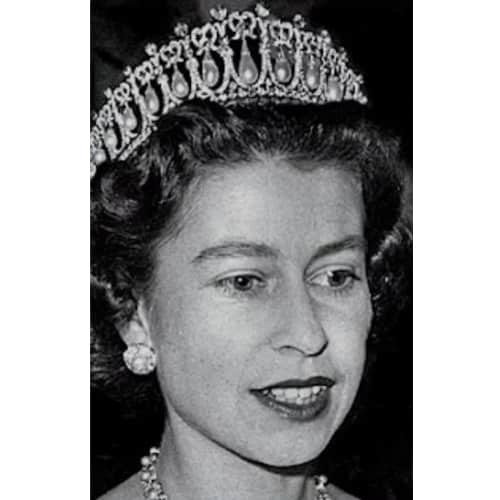 The tiara passed to Queen Elizabeth II in 1953 upon the death of her grandmother and was subsequently worn by Diana, Princess of Wales on many occasions. 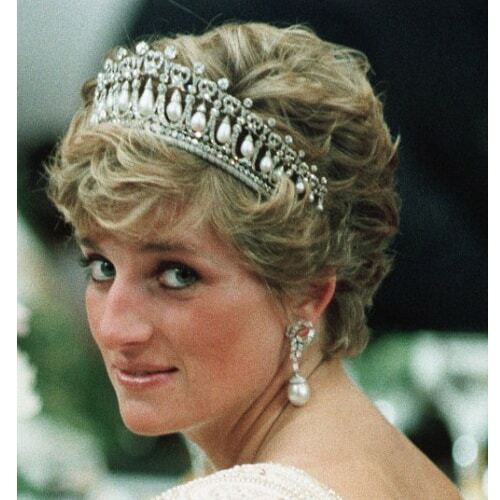 Princess Diana Wearing the Lover’s Knot Tiara. A Young Queen Elizabeth II Wearing the Lover’s Knot Tiara. Beginning its life as a tiara for the Russian Grand Duchess Maria Pavlovna, this tiara was smuggled out of Russia during the Revolution and eventually purchased by Queen Mary (along with other jewels.) 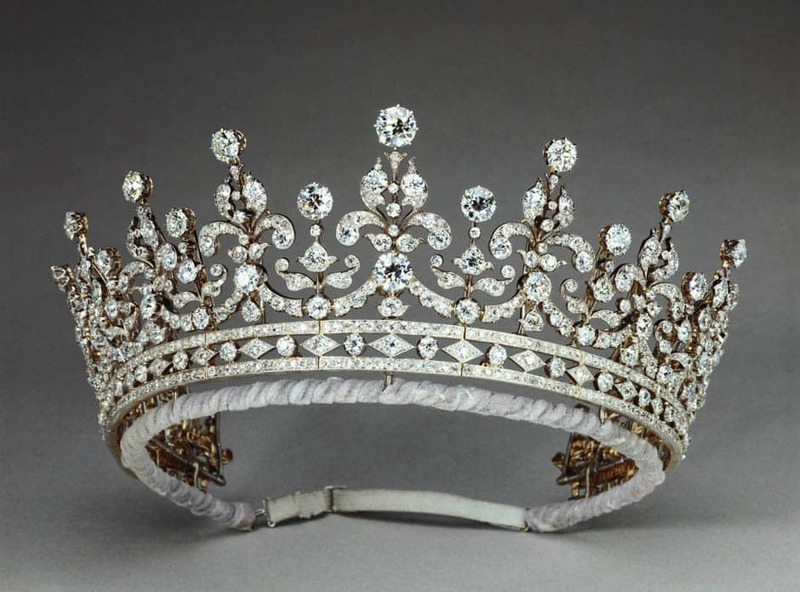 Made by Bolin c.1874, the tiara has undergone a series of renovations and an eventual complete reconstruction (originally it was gold and now it is platinum.) 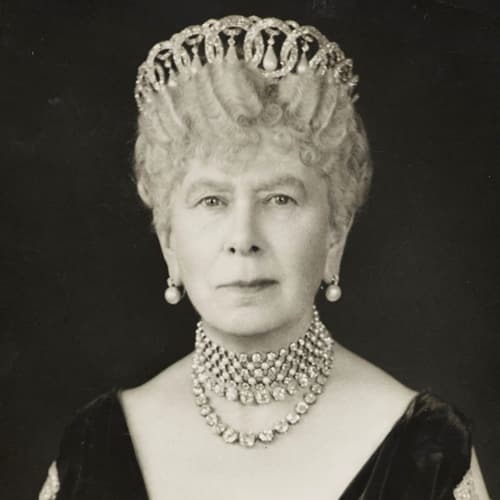 Queen Mary added the Cambridge emeralds as detachable pendants, interchangeable with the original pearl pendants making the tiara more versatile; no pendants, emeralds or pearls (or presumably a mixture of emeralds and pearls.) 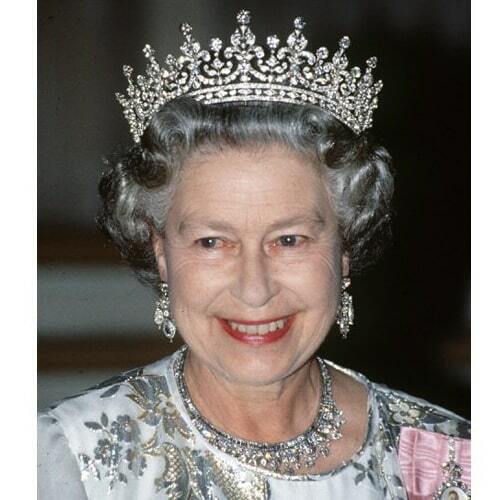 The Tiara remains popular with Queen Elizabeth II and has been loaned from time-to-time to other royals. Russian Grand Duchess Maria Pavlovna Wearing the Vladimir Tiara. Queen Mary Wearing the Vladimir Tiara, c.1947. 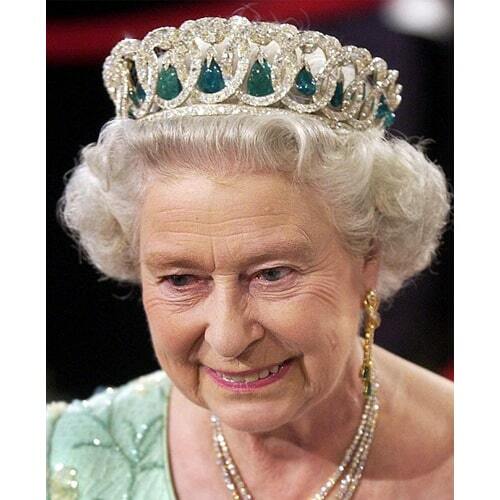 Queen Elizabeth II Wearing the Vladimir Tiara with Emeralds. Duchess of Teck Tiara with Removable Crescent Elements. This relatively modest tiara began its life as a series of inherited elements coming to Princess Mary Adelaide of Cambridge (aka Duchess of Teck by marriage) in 1857 upon the death of her beloved aunt, Princess Mary, Duchess of Gloucester and Edinburgh (daughter of King George III.) 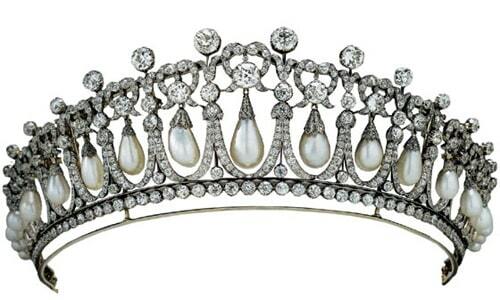 First arranged as a headband, the crescent, floral and foliate elements eventually came together as a tiara in 1882. Upon her death, the tiara went to her eldest son Prince Adolphus of Teck and daughter-in-law Princess Margaret, Duchess of Teck. 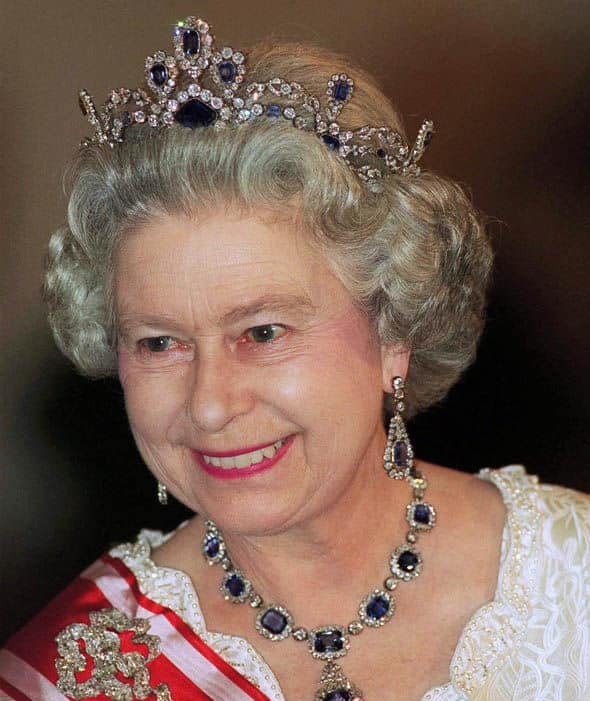 The tiara became property of Queen Elizabeth in 1937 and finally Queen Elizabeth II in 2002. It has been seen most recently worn by the Duchess of Cornwall. The Girls of Great Britain and Ireland Tiara in its Current Iteration. 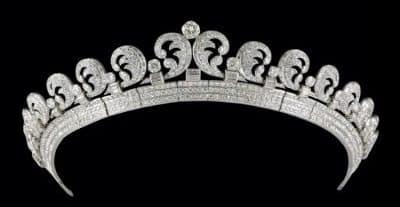 Commissioned with funds raised by a committee chaired by Lady Eva Greville, purchased from Garrard and manufactured by Wolff & Co., the “Girls of Great Britain and Ireland Tiara” was presented to Princess Victoria Mary of Teck (Queen Mary) as a wedding gift. This versatile tiara was designed to convert to a coronet and a necklace and featured 14 large pearls (that are now a part of the “Lover’s Knot” tiara) eventually replaced by brilliant-cut diamonds emancipated from the County of Surry Necklace/Tiara. Re-modeled and re-re-modeled over the years the bandeau, once removed to be worn separately, was restored by Queen Elizabeth II who received both as wedding gifts from Queen Mary. This tiara (along with the Queen’s visage) can be found depicted on paper currency issued by The Bank of England. The Teck Crescent Tiara Worn by Princess Mary Adelaide, Duchess of Teck, Queen Elizabeth (Queen Mother) and Margaret Cambridge, Marchioness of Cambridge (later Duchess of Teck). Girls of Great Britain Tiara Worn Without the Bandeau. Girls of Great Britain Tiara with Bandeau Restored. Daughter of the 14th Earl of Strathmore, Lady Elizabeth Bowes Lyon married the second son of George V, Albert, Duke of York who, in 1936, succeeded his brother on the throne as King George VI. Elizabeth had not owned much jewelry prior her marriage but that would change dramatically. Along with personal jewels gifted to her by her father, husband and other well wishers, Elizabeth was fortunate to receive a bequest from Mrs. Ronald Greville of over 60 pieces of incredible jewelry. She enjoyed her jewelry, including the Greville collection throughout her long lifetime. 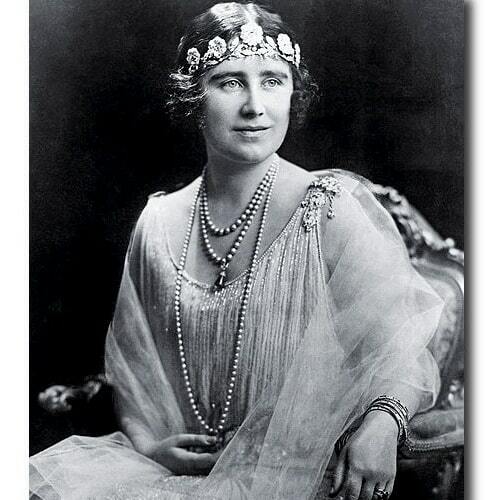 Received in 1923 as a wedding gift from her father, The Earl of Strathmore, the Strathmore “Rose” Tiara is reputed to have been made c. late 1900s, although it suited the flapper styling of the 1920s perfectly. Roses, in the Language of Flowers, represent all aspects of love, an appropriate design for a wedding gift. This versatile combination bandeau/tiara came equipped with two frames to facilitate the transformation. Additionally, the five wild rose motifs were detachable to create a spray of brooches and sapphires were provided to substitute for the removed flowers. Worn Frequently by Queen Elizabeth, Queen Mother, it has not been seen adorning any other royal pates in many years. The Strathmore Combination Bandeau/Tiara with Detachable Diamond Flowers. The Duke of York purchased the Scroll/Halo Tiara from Cartier in 1936 just prior to his becoming King George VI. Elizabeth was seen wearing it only once, before she became queen. On the occasion of Princess Elizabeth’s 18th birthday, she presented to the future Queen as a gift. Queen Elizabeth II has never been photographed wearing it, but It has been very popular as a wedding tiara for younger generations of royals. 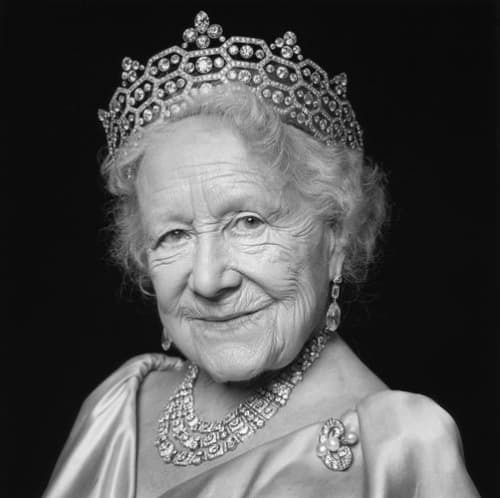 Both the Queen Mother and Queen Elizabeth II had more substantial tiaras to choose from once they became queen. The timeless tiara has been loaned to the Princesses Margaret and Anne and most notably to Katherine Middleton to be worn on her wedding day, whereupon it was listed in the wedding information provided to the press as the “Halo” Tiara. The Scroll/Halo Tiara by Cartier Most Recently Worn By Katherine Middleton for her Marriage to Prince William. This Boucheron tiara was designed by the renowned Lucien Hirtz, using diamonds from a previous Boucheron tiara owned by Mrs. Greville. Switching the gems from the original tiara provided a complete update to the collection, from antique to modern. 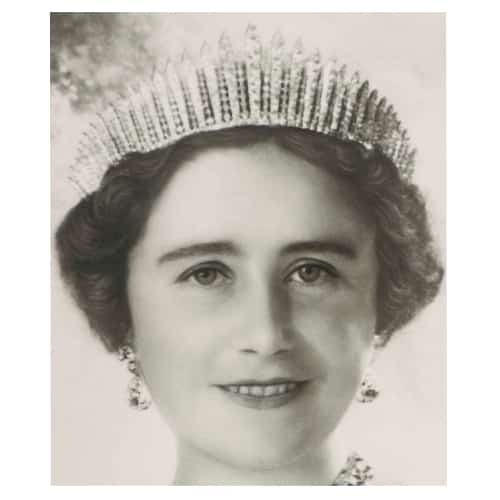 Known for its unique honeycomb design, the tiara was slightly remodeled by Cartier, after its bequest to Queen Elizabeth, to rearrange larger gems at the top (and adding some from a brooch) to give the jewel more height. The result was one of the Queen’s favorites, one she wore often. While Queen Elizabeth II has never worn this favorite of her Mother’s, it has been spotted recently, and often, atop the head of The Duchess of Cornwall. The Greville Tiara with the Alteration by Cartier Adding Diamond Clusters to Provide Height. 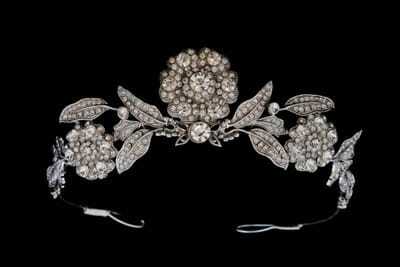 The Strathmore Tiara Worn as a Bandeau by Queen Elizabeth (Queen Mother) c.1920s. The Scroll or “Halo” Tiara Worn by Katherine Middleton on her Wedding Day. 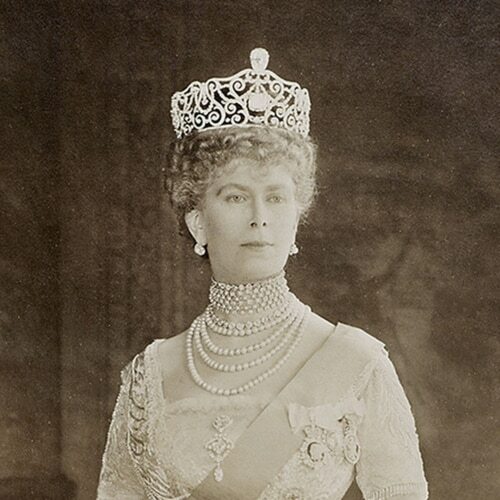 The Greville Tiara Worn by The Queen Mother, One of her Most Favorited Tiaras. As the firstborn daughter of Albert and Elizabeth, Duke and Duchess of York, Princess Elizabeth was not in the direct line of succession until her uncle, Edward VIII, abdicated the throne in 1936. Suddenly thrust into the role of “Heiress Presumptive” there were many changes in her life (and that of her family) not previously anticipated. One rather splendid change was receiving gifts of magnificent jewelry and gems to mark the occasions in her life. Her engagement, marriage, and ascension to the throne were all opportunities for her family and the international “well-wishers” of Great Britain and the world to present her with increasingly opulent gifts. 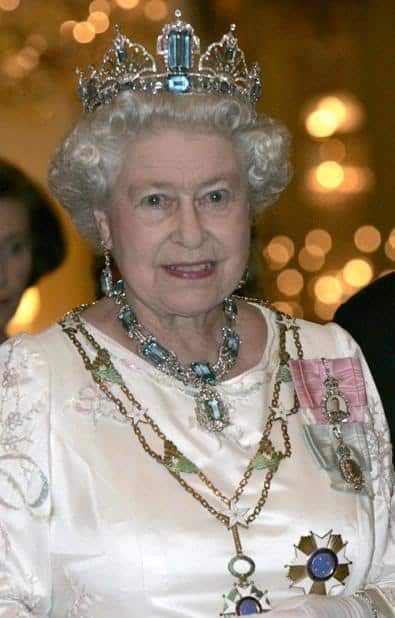 As the first reigning female monarch since Queen Victoria, Queen Elizabeth also received the jewels that had passed through generations of Queens consort to sparkle alongside her abundant personal collection. Although the Queen has added a few tiaras to the collection since her coronation, Queen Elizabeth II seems largely content to bedeck herself (and others) with the magnificent tiaras of her ancestors. Queen Elizabeth II Wearing the Burmese Ruby Tiara. 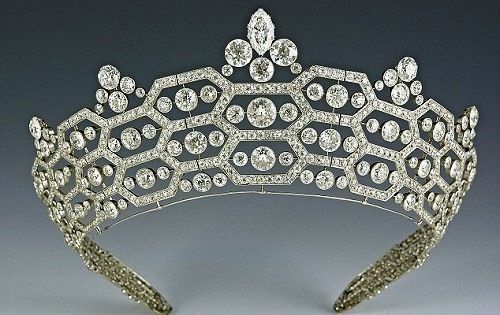 A wedding gift from the Nizam of Hyderabad this Cartier tiara had three detachable rose design brooches. 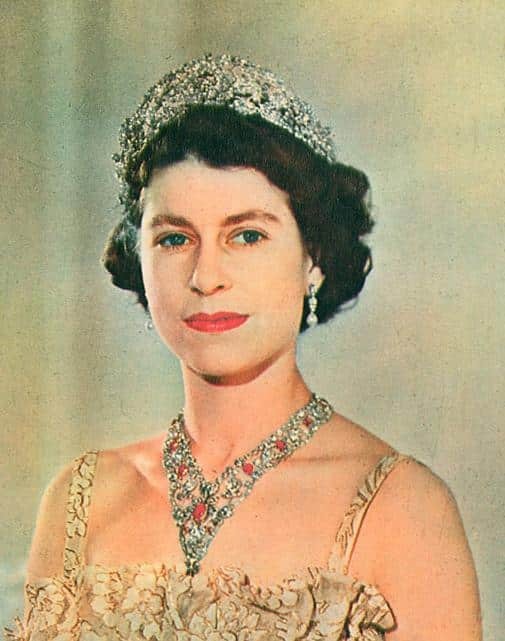 Circa 1973 the tiara was scrapped in order that the Queen could commission Garrard to formulate a new tiara with the stones, adding a plethora of rubies from the Queen’s personal collection. Admirably designed as a wreath of roses, each centered upon a ruby floral cluster designed to give the illusion of a single larger gem, and interspaced by rays of diamonds. She appeared at a Silver Jubilee event in an ivory gown designed to set off the new tiara. Commissioned by the Queen from Garrard’s, this tiara was designed to match a suite of jewelry presented by the Government and people of Brazil to the Queen on her Coronation and with pieces added on subsequent occasions. The tiara prominently features several large aquamarines with diamond arched surrounds and compliments the aquamarine jewelry suite admirably. A wedding gift from her father, King George VI, this magnificent suite of sapphire and diamond jewelry prompted the Queen to commission a tiara (1963) to complete the ensemble. 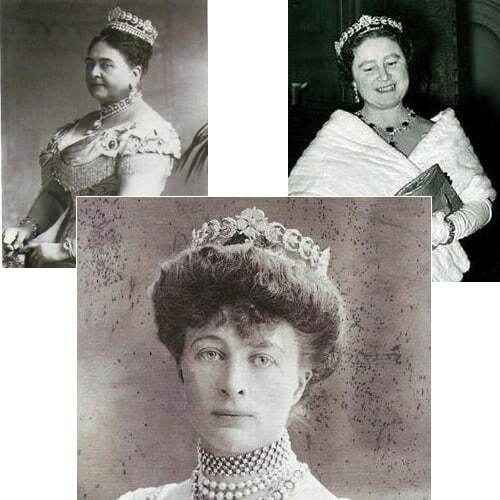 Because of their remarkable similarity, the tiara is reputed to have been created using a necklace the Queen purchased, formerly the property of the Princess of Saxe-Coburg-Gotha, Louise of Belgium. Queen Elizabeth II Wearing the Nizam of Hyderabad Tiara. Queen Elizabeth II Wearing the Aquamarine Tiara. Queen Elizabeth II Wearing the Sapphire Tiara. Blair, Claude: General Editor. The Crown Jewels: The History of the Coronation Regalia In the Jewel House of the Tower of London (Volume 1: and Volume II), London: The Stationery Office Ltd., 1998. Munn, Geoffrey. Tiaras: Past and Present. London: V&A Publications, 2002. Pope-Hennessy, J. Queen Mary 1867-1953, London, 1959. Roberts, Hugh. The Queen’s Diamonds. Royal Collection Publications/© HM Queen Elizabeth II, 2012.